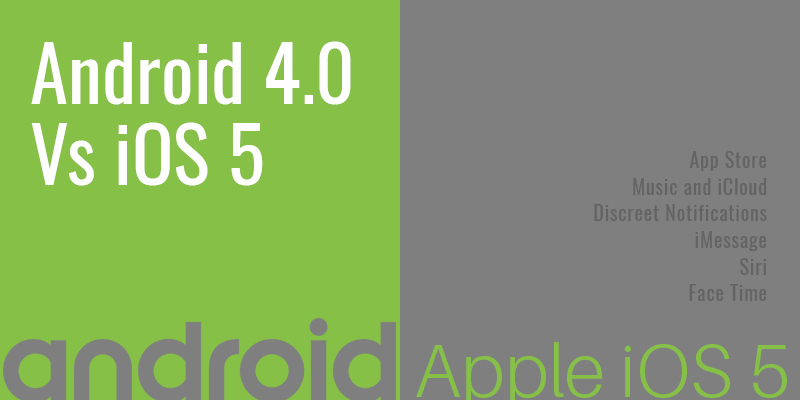 Recently Android and Apple both released new operating systems for their mobile devices; Apples iOS 5 and Android 4.0, also known as “Ice Cream Sandwich”. I’ve taken the time to watch the video’s and read their sites boasting about the “new advances” and “exciting upgrades” and here are my thoughts. Firstly, I want to go ahead and say I do not lean one way or another. I really don’t care who comes up with this stuff, I just want to play with it like the rest of the world. So this blog is merely my observations and opinion. Secondly, I’ll go through some of the features that are being highlighted and, if needed, quickly state my thoughts from a consumer’s perspective. Currently iOS 5 can run on multiple devices but works best on the iPhone 4S. The concept of a simple UI is still not lost here. Although a few more tricks have been added to taking screen shots, Launching “Siri” or the new notifications menu, it’s safe to say you’ll still know exactly how to use it. Music and iCloud – One of the star features of owning an iPhone is still there but with an extra advancement, wireless syncing. Now as long as you are charging your phone near your mac or pc and still connected to Wi-Fi, it will automatically sync to iTunes. This is happening through the iCloud, which lets you sync apps, music contents and even edit photos, and manage calendars and emails. This will let you restore all of that data anytime. Thoughts – Again, nothing new. The first Windows phone had the ability to wireless sync with Zune (their iTunes) and backup contacts, pictures etc. with SkyDrive (their iCloud). Regardless, this is definitely a good feature, whoever came up with and having a variety of phones with these capabilities is going to make a lot of lives easier. App Store – No one can even come close to competing with Apple’s app store. There are over 500,000 apps to choose from, not all of them are great but with numbers like that, there is something for everyone. Thoughts – Although it’s true, no one can beat the amount of apps in the Apple App store, Android is beginning to close the gap a bit with a little over 250,000 and counting. Innoppl Technologies in Atlanta, GA is constantly getting requests from business and entrepreneurs across the Southeast to build custom apps, and not a single one has limited the development to only one platform. Discreet Notifications – This is one of the features that Apple is really excited about. The idea that whatever application you are currently running will not be interrupted by a notification from say facebook or an incoming text message/email is a nice escape from the front and center pop up. The notification will appear at the top of the screen and if you decide you’d like check them, simply drag down the menu and by sliding your finger across it the notification you can open it and it will take you to that function. Thoughts – This is definitely not new or exciting for me and actually has become something I come to expect. The first time I saw this was on my Google G1 (HTC Dream) 4 years ago. 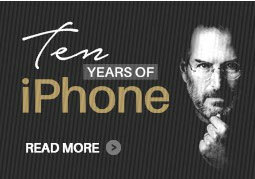 That phone was running Andriod 1.0…. we’re up to 4.0 now. iMessage – Blackberry lead the way with BBM but definitely did not manage to make it as seamless as Apple has. The phone will switch effortlessly between regular SMS messages and iMessages when it detects that the messages are originating from another iOS 5 device. This means, these messages are not counting against your rate plan, so more texts for you! Although, most people have unlimited texting now a days, but this is nice for parents with teenage girls. Thoughts – Again not a new feature, but for people unfamiliar with BBM, they will find it interesting. I am glad Apple decided to add this to its new OS, reality is there are a lot more people “chatting” on iPhone’s than on Blackberry’s. Siri – This is iOS’s voice-triggered assistant that replaces the voice control app. Siri has attitude and can converse with you like a friend would. The real advancement with Siri is the ease in making requests. The bit of personality Siri brings is a fun addition, but just like most voice command apps, she’s not perfect. Face Time – New addition for this OS but not a new invention. It’s been around for a while now but the idea of chatting face to face on your phone without using your minutes is a nice thought. Thoughts – Again this is not a new technology, but being able to chat with someone “face to face” AND it doesn’t count against your minutes is nice. But be careful with your data plans, because it will count against that if you’re only allotted a certain amount of data per month. Final thoughts – it’s the iPhone, it doesn’t matter what I say or anyone else says. There is an entire culture of people that swear by these products and love everything they do, even if there are many “borrowed” ideas from competitors. Although, there is one thing that will never change when it comes to iOS, and that’s the simplicity. At Innoppl Technologies in Atlanta, GA and in the San Francisco Bay Area, we are asked to build apps regularly for business purposes and consumer purposes. Our clients have incorporated the mobile lifestyle into their employee’s daily lives by adding tablets and smart phones as part of their operational processes and the phone and tablet of choice, is always the iPhone, iPad combo. They are powerful tools, but designed so anyone can pick it up and use it to its fullest potential. Commanding UI – There isn’t another OS out there that can compete with Androids ability to customize home screens etc. Yes it’s true that the menu is not in the center of the screen directly in the middle and someone who doesn’t know what they are looking for won’t find it; the ability is there for the curious. Or for whoever reads their owner’s manual! Basically Android has raised the bar with the ability to customize with moving animations, widgets (that are resizable) and tons of apps. Thoughts – UI is amazing, many options and for some that is essential while for others… not so much. Only gripe? If I’m not curious enough, I won’t even see half these features and miss out on a huge advantage of having the phone. Turn by Turn Navigation – That’s right ladies and gents, Google maps with the addition of voice direction. For a lot of people this means eliminating the extra device in the car mounted to the windshield, as well as the convenience of having a turn by turn navigator handy for any situation; like when you’re friend absolutely knows the way but the roads must have changed recently! Thoughts – OMG, those moments of a friend having no idea where they are going will be gone?! I love this and I am sure many people will! Although, since I am taken the long way home so often, I wish better maps could be used. Camera – Ice Cream Sandwich has quite a bit of features with its camera. The one feature most boasted about is the ability to take panoramic pictures. The phone essentially takes multiple stills and stiches a seamless panoramic rendition of the shot. It also has an editing gallery for red-eye reduction, and Instagram type filters. Facial unlocking – There really isn’t anything useful for this feature but it’s fun none-the-less. Point the front facing camera at your face and it will detect your features and unlock your phone. Thoughts – Again, not sure how useful this is but it’s a nice conversation piece. Near-field Communication – This slowly becoming more popular in the mobile environment. Basically if you have an NFC-Compatible phone you’ll be able to utilize Google Wallet. This is software used to pay for purchases by tapping or waving your phone near a payment terminal. Thoughts – Not sure how useful this is, I mean sliding my card really isn’t too difficult and what kind of ramifications could I have if I lost my phone or something? Is there a way to deactivate it? I don’t have all the details but I definitely have a lot of questions about this.